The Tesla Model S P100D is riding high after winning the latest running of Motor Trend’s World’s Greatest Drag Race against automotive heavyweights like the Ferrari 488 GTB and Porsche 911 Turbo S. For an even bigger test, DragTimes now challenges the American-made electric sedan against a McLaren 720S, which produces 710 horsepower (529 kilowatts) from the factory – although dyno results point to McLaren underrating the published output. Before getting too far into discussing this video, understand that there’s something that sticks in our craw about this clip. The Tesla Model S P100D costs at least $135,000 after destination, and the McLaren 720S is $284,745. With a minimum $419,745 of vehicles on display here and speeds far above the posted limit, there’s no good excuse for not paying for access to a drag strip or some other private facility. Drag racing on public roads isn’t appropriate, although DragTimes has stated it is a controlled environment for what it is worth, so maybe it has the proper ok to perform the test. 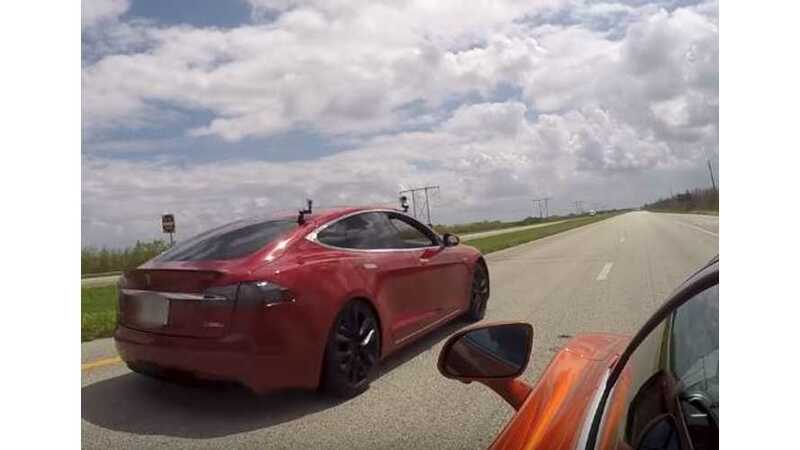 DragTimes’ video shows three tests of the Tesla versus the McLaren: two from a complete stop and one from a roll. Each time, the Model S jumps to an early lead from the instant torque available from its electric motors. To avoid any spoilers, watch the clip to see the winner of each round. The 720S will only become quicker in the future because McLaren will eventually add a higher performance Long Tail variant to the range as a successor to the 675LT. The company would slice weight off the coupe and likely boost the output from the 4.0-liter biturbo V8. The Model S is also likely to gain performance, though. Tesla continually upgrades its products both through new hardware and optimized software.